Many interesting plants for the garden share desirable characteristics of bloom, habit, ease of cultivation and a host of other attractive attributes — after all, that’s why they have reputations as choice plants. 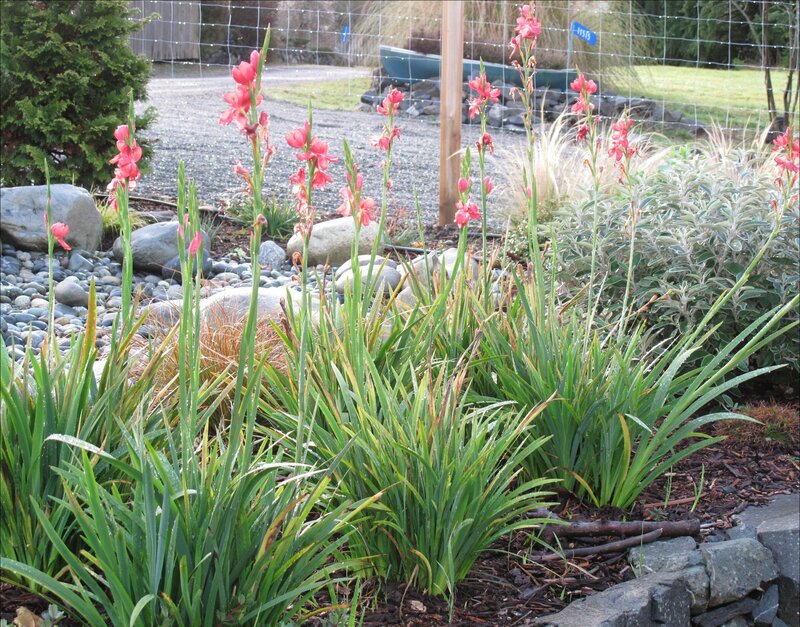 Here’s a worthy garden plant for the Pacific Northwest whose two most salient characteristics are prominent winter blooms of stunning crimson flowers and a history of confusing and (in one case) a downright offensive name. This relative of the gladiola started blooming for me in late summer and continues to this day (late January 2013), even after night time temperatures dropped below 32° for four or five consecutive days a earlier in the month. The six mature clumps shown below were started from four inch pots last May, probably propagated from divisions; the starter plants were only just poking out of the top of the pot by about 3 inches. More than seven month later new shoots at the base of each clump are visible and will probably make it easy to propagate new clumps. Now for the naming issues. Botanists have recently settled on Hesperantha coccinea, but in the nursery trade, Schizostylis coccinea predominates. There is, of course, the usual confusion with genus and species names, mostly due to ongoing botanical research using newer molecular techniques such as DNA sequencing. But even before that research, plant biologists were constantly coming up with new classifications based on the visible characteristics. For that matter, relationships between plant populations has never been an exact science, since nature constantly surprises. It is the common name where this plant’s story becomes uncommonly interesting. The origins of the term apparently originate in the antecedents of the Arabic language, where its root letters acquired the meaning of to cover or to hide. Later, “kafir” was used to describe unbelievers, or those who rejected the Islamic faith. By the 15th century the term was used to describe non- Muslim African natives. Apparently by the 20th century the word had morphed into a racial slur, equivalent to the American “N” word. Other common names used in lieu of Kaffir Lilly are Crimson Flag and Crimson River Lilly. Hesperantha coccinea belongs to the Iridaceae family, which also includes gladiolas. The rhizomatous perennials of the genus Hesperantha have sword shaped leaves and starry, often cup shaped flowers borne on tall spikes. A mature clump’s height varies from about 15 to 36 inches. The South African species hails from a summer rainfall area, which is widely distributed throughout the eastern provinces of the country. The species name coccinea means ‘scarlet’ and refers to the bright red flowers. Until fairly recently this species was known by its old name Schizostylis coccinea. 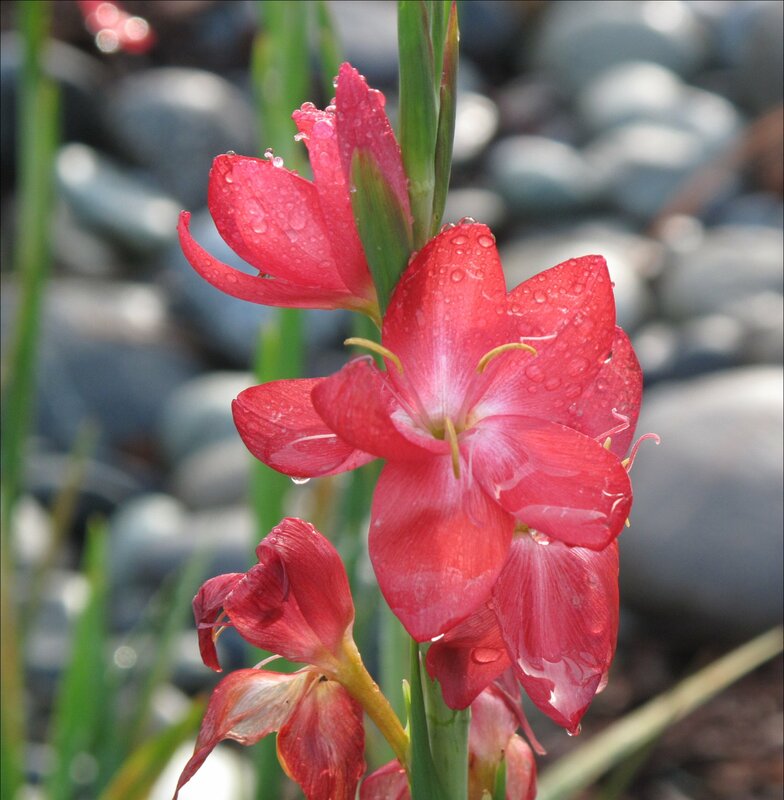 Hesperantha coccinea is a water- loving, bulbous perennial that adapts nicely to our cold wet climate. It occurs naturally growing in full sun on saturated soils often associated with stream banks. Although the flowers are normally bright red, there are also pink and white forms within the genus, which consists of about 65 different species. The color of the cultivar Oregon Sunset closely resembles the species. 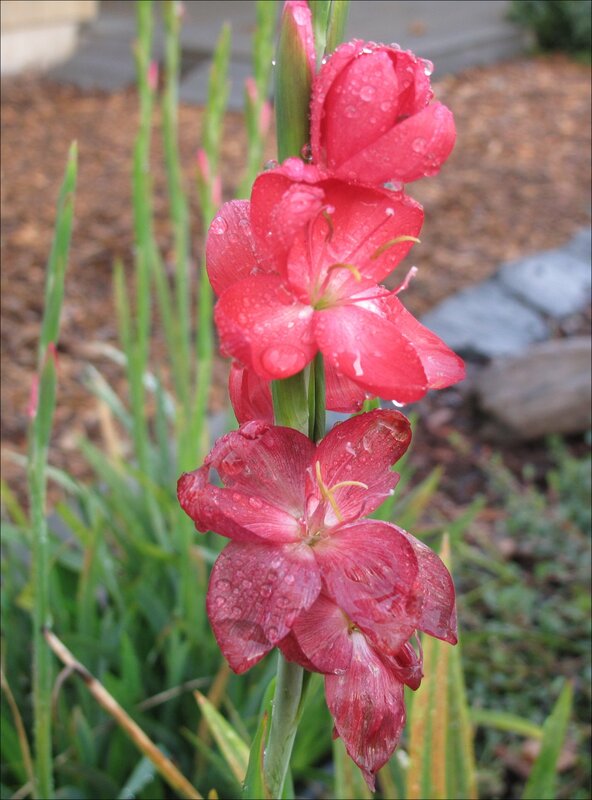 This entry was posted in Plant Picks and tagged Crimson River Lilly, gladiola relative, Hesperantha coccinea, Iridaceae Family, Kaffir Lilly, Schizostylis coccinea by Bart Arenson. Bookmark the permalink.